Just 33 more sleeps, that’s all. I try to avoid thinking too much about upcoming fishing trips. It’s distracting, and it can actually make the time go slower – “a watched pot never boils,” as my wife frequently reminds me. But I can’t help it. I am among the lucky ones who will drop the first lines of the season at Langara Island (we leave on June 1, which is just 33 more sleeps from now in case I didn’t mention that already). And since I can’t stop thinking about it, I thought I might as well crank out a report on what I think we can expect beginning May 31 for the first guests at The Clubhouse, June 1 at North Island Lodge, and June 5 at The Outpost. I must preface this by saying that even the finest fisheries scientists cannot predict exactly when Salmon will begin to migrate south, or when and where bait will begin showing up, or how much of it there will be to draw Salmon into areas where those of us with primitive urges await. Even so, the Department of Fisheries and Oceans research team pretty much nailed it in their pre-season outlook in 2014 when the data suggested “near target” or “abundant” returns of Coho and Chinook Salmon up north. Sure enough, for all but only a handful of days, the fishing at all three lodges was the kind that keeps some of us awake in the final nights before we return the following year in hopes of doing it all over again. Alas, however, the 2015 pre-season outlook has not yet been released. So what then do we know 35 days out? First of all, I think it’s meaningful that the last two seasons have been off-the-charts at Haida Gwaii, presumably the result of healthy amounts of bait pouring in from Dixon Entrance on a consistent basis. 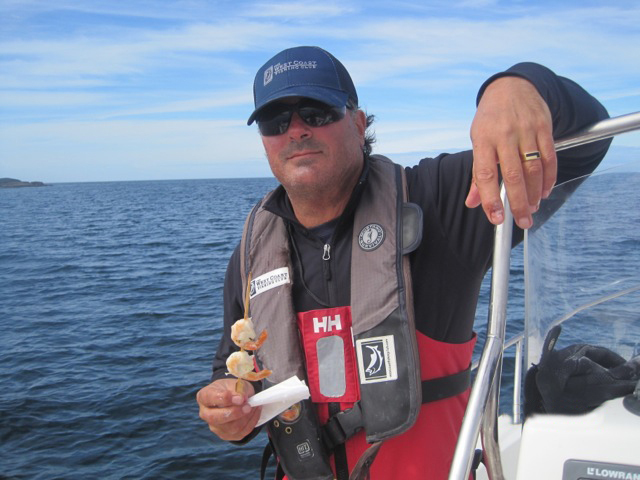 The Clubhouse head guide, Mike “Screamer” Tonneson, who has a formula for assessing the size of herring clusters, reported seeing bait balls of up to ten tons on several occasions last year, and produced photographic evidence that the herring were inordinately large – as much as 27 centimetres (10 inches). Although investment advisors always warn us not to buy stock based on previous performance, it’s hard not to be bullish about the upcoming season when the bait indicators were so positive in prior years. Secondly, this year’s fishing for winter Chinook around Vancouver and various spots off Vancouver Island has been better than usual, which is a relief since many southern areas appear to have been in a state of decline over the past couple of decades. With that as context, I am anxiously looking forward to hearing from our guides who will be testing the waters at Haida Gwaii in about four weeks to see if this translates into above average numbers up north too. For what it’s worth, I am betting that these two factors – spectacular fishing for our guests the past two years and decent winter fishing down south – point to another banner season in 2015. And what excites me even more is that June has been anything but a shoulder season. Take last year for instance. On May 30, the first guests at The Clubhouse climbed out of the helicopters to a champagne brunch and then headed out on the water for the annual Short Notice Club derby. As I recall, all guests limited out on their trip and six tyees were caught, including the 54-pound derby winner for Doug Shigaki. Meanwhile over at North Island Lodge, it took just 30 minutes on opening day for Chris Mackay to net the first tyee of the season. And when The Outpost opened up a few days later, it was a similar story, with boats catching 30-40 Chinook a day at Three Rocks, although it wasn’t until the second trip that the first tyee went into the books – a 36 for Liz Mullins. Lots of Halibut for The Outpost gang too in the early going. Recalling all of this, yes, I’m distracted by the prospects of another incredible season at what has become my favourite place on earth (my ashes, for the record, are to be distributed at Cohoe Point). It doesn’t help that I was part of the vintage action in June of last year, followed by a historical Tuna expedition the third week of August at The Outpost. I’ll be heading to North Island Lodge for the season opener, which will be slightly different now that its much-loved executive chef, Walter Pelleccia, is a twinkling star in the northern sky. But I’m looking forward to the first annual tribute to Walter in the form of the Ultimate Grill Showdown, which in its inaugural year will feature Chef Ted Reader, aka “The Godfather of the Grill,” and Park Heffelfinger, owner of Memphis Blues BBQ House. It would mean the world to Walter to know that the North Island Lodge staff and the legions of regulars will gather at the end of the first two days to learn a few barbecue tricks courtesy of Ted and Park, and to tip a glass of Grappa in his memory. Later in June I’ll be at The Outpost, cruising the waters between Three Rocks and Hippa Island and savouring the indescribable fare prepared by the uber-talented husband and wife chef team of Paul Moran and Stephanie Noel. Foodie-type fishers may already know that Paul recently won the 2015 San Pellegrino Best Chef Under 30 in Canada competition, and will soon represent Canada in Milan, Italy for the title of World’s Best Young Chef. Gotta hand it to The West Coast Fishing Club; they don’t hold back on anything when it comes to culinary matters. That’s it for now friends. Check back to this space beginning at end of May when I will pass along some pre-season intel from the all-star West Coast Fishing Club guides in the first of our season-long Ebb and Flow weekly fishing reports. Don’t forget to check for regular lodge reports too once the action gets under way. And if you haven’t yet booked a trip, best get on it soon. Judging by the number of returning guests, I’m not the only one counting sleeps.